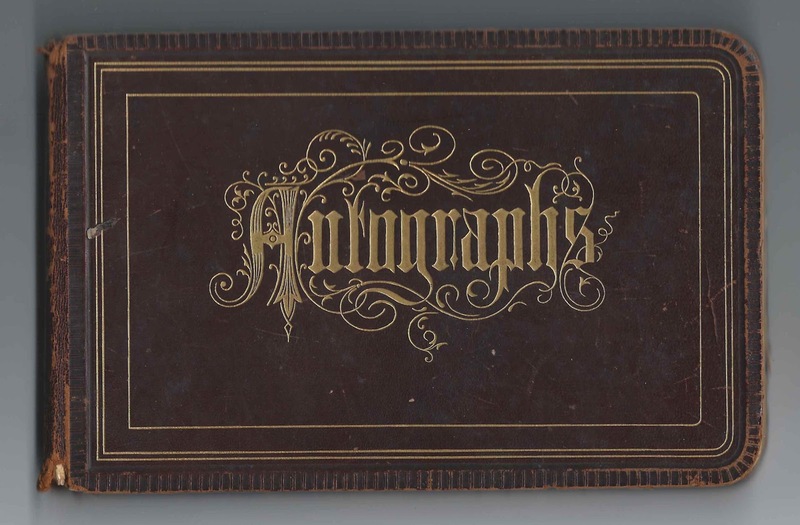 1870s/1880s autograph album of Inez C. Holcomb of Windsor Locks, Connecticut. Two pages were signed in a later era, in 1903 and 1904. The album measures approximately 7-3/4" x 6" and contains the sentiments of 90 of Inez's relatives, friends and schoolmates. An alphabetical list of the signers, complete with any residence and school information, appears at the end of this post. Inez C. Holcomb was born 3 April 1859 in Connecticut, the daughter of Nathan R. Holcomb and Caroline C. (Hazard) Holcomb. 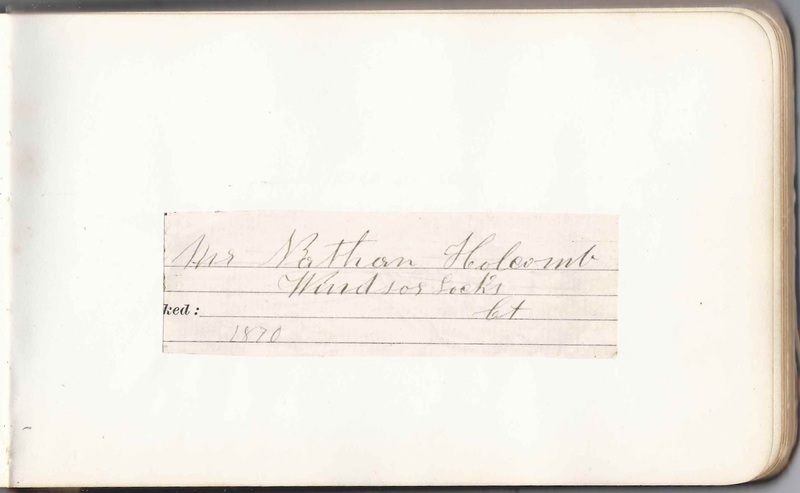 Nathan R. Holcomb died in 1873, before Inez began compiling autographs, but she apparently found a paper that her father had signed in 1870 and pasted it into her album. 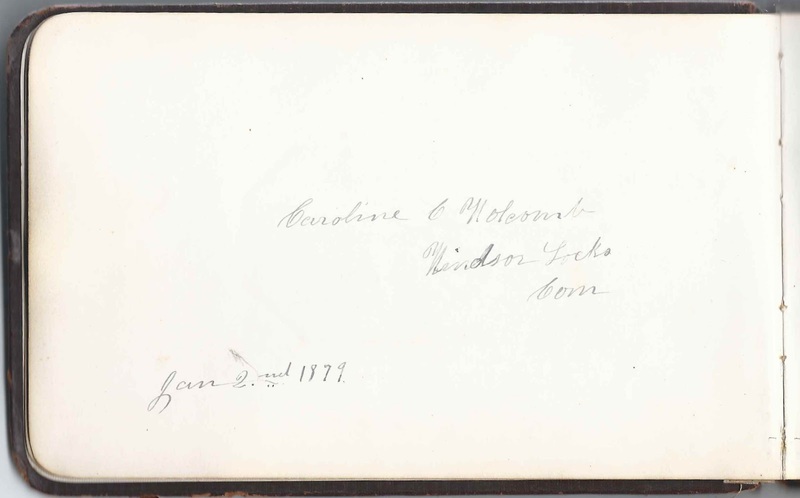 Inez's mother Caroline C. (Hazard) Holcomb of Windsor Locks, Connecticut, inscribed a page in the album on January 2, 1879. She would die in 1883. 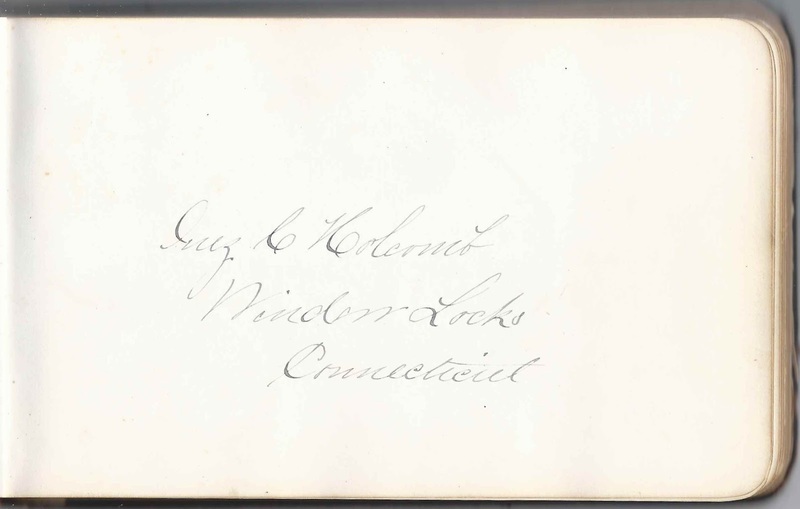 Inez's sister Ella Holcomb signed a page at Windsor Locks, Connecticut, on August 22, 1875; her middle initial was C or O or ? 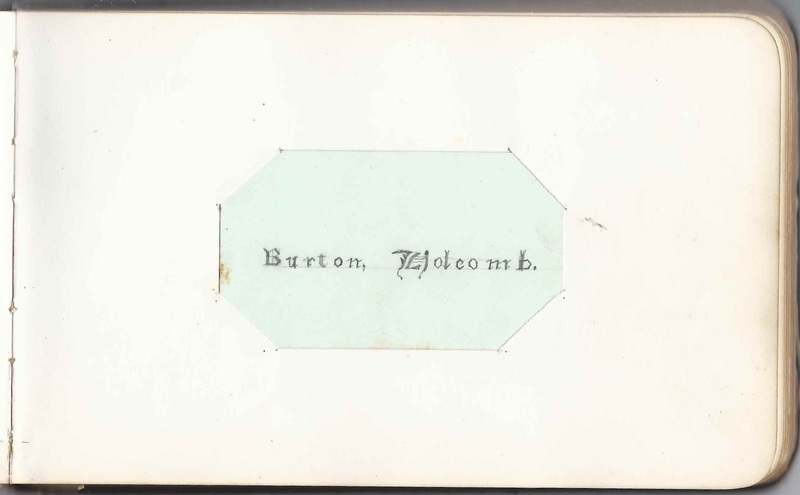 The handwritten calling card of Inez's younger brother Burton Holcomb is inserted into one page. Sadly, Burton, who was born in 1862, died in 1875. It may not have been Burton who inserted the card, but Inez, after his death. Inez had a brother Horace who died in infancy in 1854. I think the Agnes C. Holcomb enumerated in 1910 with the Phillips family of Hartford, Connecticut, was actually Inez C. Holcomb. 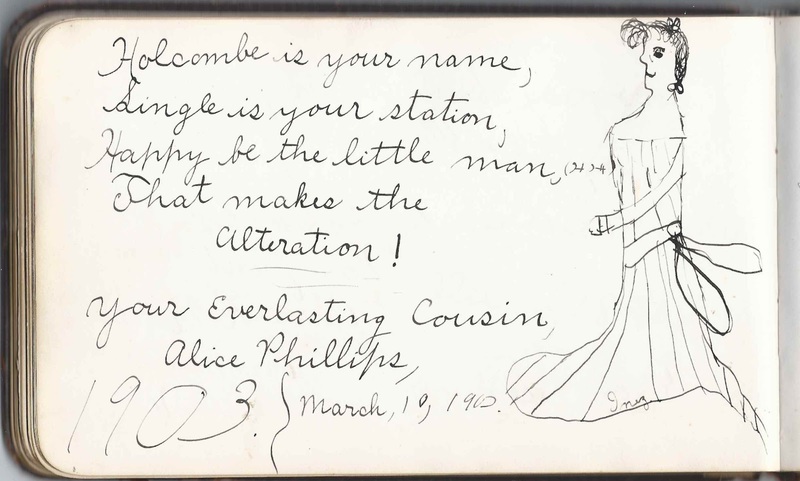 One of the people in the household, Alice C. Phillips, was likely the Alice Phillips who called herself Inez's cousin, on the page she signed on March 10, 1903. She included a sketch of Inez! Alice's parents were Joseph Henry Phillips and Clara Josephine (Fiege) Phillips. 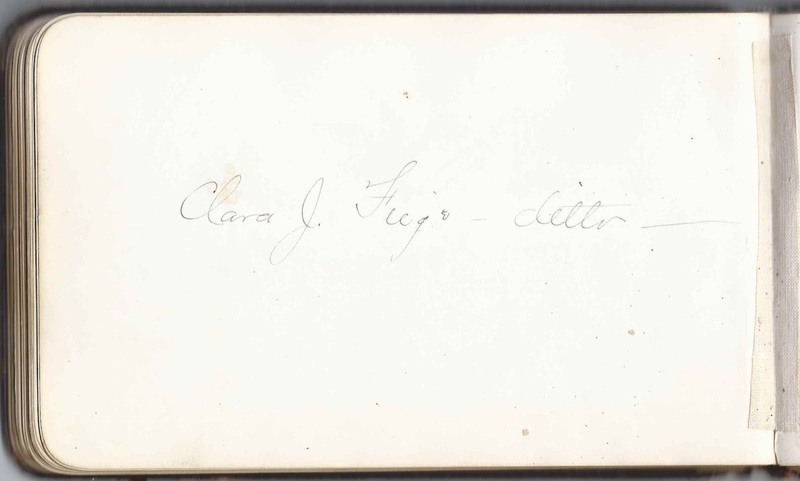 Before her marriage to Joseph Henry Phillips, Clara Josephine (Fiege) Phillips signed a page in Inez's album. Clara's parents were Augustus and Flora (Hazard) Fiege. I believe that Flora and Inez's mother Caroline C. (Hazard) Holcomb were sisters. About a month after the enumeration of the 1910 Census, Inez was badly injured in a railway accident. Whether or not this accident contributed to her death on 11 March 1917 at Windsor Locks, Connecticut, I don't know. Several other people named Holcomb signed pages in the album; refer to the list below. If you have corrections and/or additions to the information above, or information on any of the signers listed below, please leave a comment or contact me directly. Thanks! Signed by ? "General Hardware", 68 Main Street, Southington, Connecticut, on "8/5/78"
Amy, signed on August 23, 1877; "your loving sister". Not sure whether she is a full sister, half sister, step sister, sister-in-law or social or religious sister. Annie Beach, signed at Goshen, Connecticut, on July 13, 1876; very faint and can't make out middle initial. Dwight W. Chapman of Windsor Locks, Connecticut, signed on December 25, 1875. "Remember Talcot Mountain"
Mattie L. Collins of Plantsville, Connecticut, signed on September 6, 1878. "Remember our trip to L.L. and S.M." Charles A. Fox of Hartford, Connecticut, signed on September 20, 1878. Class of 1874 at Hartford Public High School. N. W. Hayden of Windsor Locks, Connecticut, signed on October 19, 1876; presumably Nathaniel W. Hayden. Caroline C. Holcomb of Windsor Locks, Connecticut; signed on January 2, 1879; she was Inez's mother. Burton Holcomb, Inez's brother. He cut slits into the page and inserted his handwritten calling card. 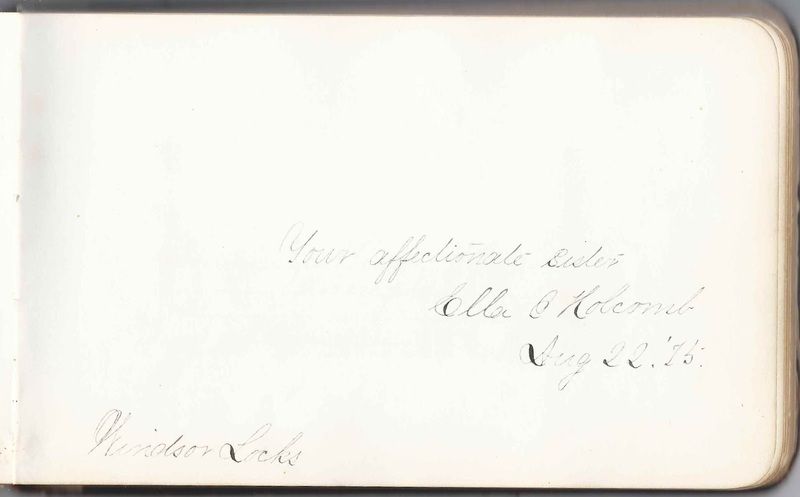 Ella Holcomb, signed at Windsor Locks, Connecticut, on August 22, 1875; not sure of middle initial - could be C or O or ?. Inez's sister. Mr. Nathan Holcomb of Windsor Locks, Connecticut; Inez's father. His name and address were on a paper scrap pasted on the page. The scrap has a date of 1870 and most likely predated the album; in fact, it was likely that Nathan had passed away before this scrap was found and pasted in the album. Jennie M. Holcomb of Princeton, Illinois, signed on August 7, 1878. "Don't forget our visit to Plantsville." Lillie M. Hough, signed on June 22, 1876 at Plantsville, presumably Connecticut. 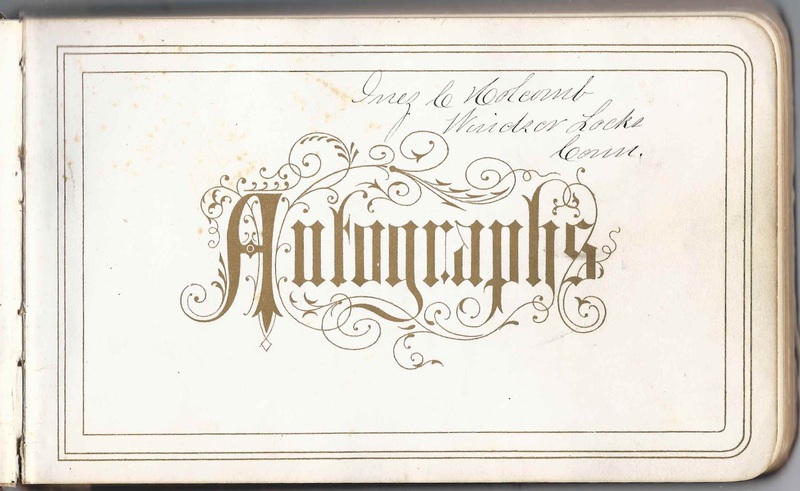 George William Lincoln, signed at Windsor Locks, Connecticut, on November 23, 1878; "Your Friend and Rector"
May B. McManamon of Windsor, Connecticut, signed at Bed time on July 8, 1881. "Fire-works at W.P."
? Mitchell of Hartford, Connecticut. Initials are possibly E. V. Mitchell. George M. Montgomery of Windsor Locks, Connecticut, signed in September 1875 "He pulled his red bandana and wiped his weeping eyes"
George Nichols; wrote June 1, 1850, which was perhaps his birthday. George E. Owen of Hartford, Connecticut, signed at Hartford Public High School on December 14, 1875; "O.D.F.S." Clara Peck, signed at Windsor Locks, Connecticut, on July 2, 1883. She mentioned "Class Day, June 26, 1883"
Alice Phillips, signed on December 6, 1896; "your loving cousin"
Alice Phillips, signed March 10, 1903; "your everlasting cousin". She drew a sketch of Inez. F. G. Pomeroy, signed on April 16, 1884; G.F.B. Whang Kae Kah, signed on November 19, 1875 at H.P.H. School in Connecticut; presumably a member of the Chinese Educational Mission who was attending Hartford Public High School. He may have been the Wong Kae Kah who subsequently attended Yale University.